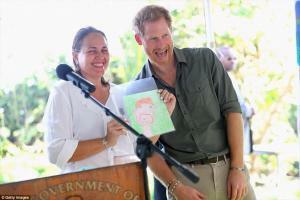 In the wake of the national ban on turtle hunting in St.Vincent and the Grenadines, the efforts of those involved in the St. Vincent and the Grenadines Preservation Fund Turtle Conservation Project were endorsed publicly by His Royal Highness Prince Harry during his visit to Colonarie on the windward coast of St. Vincent on 26th November 2016. Colonarie beach was selected by the National Parks Authority and the Fisheries Division for the Prince’s visit due to it being the second highest turtle nesting habitat in St. Vincent and having been declared by the National Parks Authority as a Protected Turtle Nesting Habitat. In her welcome remarks, SVGPF Coordinator ,Louise Mitchell explained the project’s aim to educate children and coastal community members about the need to protect vulnerable sea turtles that nest on our beaches. She explained how the community had welcomed the opportunity to participate in the project, ensuring that their grandchildren would see sea turtles. Ms. Mitchell also publicly recognized the vision of SVG’s Prime Minister Dr. the Hon Ralph Gonsalves in the recent decision of his Government to declare a total ban on the killing of sea turtles as of January 1st 2017, and for being the first in the OECS to have the total protection of sea turtles. She concluded her remarks by stating:- “On behalf of the SVG Preservation Fund and its founders Bryan Adams and Ben Goldsmith and Friend of the Fund Burak Oymen, as well as the National Parks Authority and the Fisheries Division I wish to thank you, Your Royal Highness Prince Henry of Wales for taking the time to visit this project, your presence here will serve to further strengthen our resolve to continue on the path of conservation so that St. Vincent and the Grenadines can be a beacon of light in the preservation of the wildlife.” The Prince viewed an exhibition of artwork done by primary and secondary students and presented children with gifts and prizes. Louise Mitchell then invited him to speak and in what she later described as a “million dollar endorsement” for SVG’s efforts to pioneer conservation in the OECS, the Prince spoke highly of the project as reflected in this excerpt: “ I just want to say to the Prime Minister and Louise (Coordinator of SVGPF) and everyone else for making St. Vincent a turtle sanctuary- what you have achieved in such a short space of time and what you hope to achieve from January 2017 is a huge, huge thing and I know there are a lot of islands who are way behind what you guys are doing and if St. Vincent can take that leadership for turtle conservation and encourage more people to come from all over the world to see your leatherbacks and green turtles, you are proving to people that it is possible.” The Prince also commended the children on their artwork and emphasised the importance of their role in the future sustainability of conservation efforts being made now. He was captivated by the children’s art and took his time to view the entries for the Art and Essay competition initiated by Hon. Saboto Caesar, Minister of Fisheries, under the theme ‘No Extinction in My Generation’ to build awareness among children of the need to conserve sea turtles. It is noteworthy that Hon Minister Caesar has started an OECS campaign against the capturing of turtles, which he intends to become a hemispheric reality. 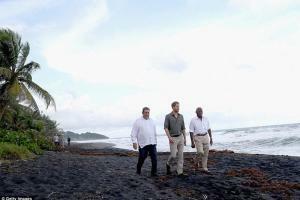 Prince Harry was then escorted along the beach by turtle monitors Raven Hoflund (Mustique) and Roseman Adams (Union Island) who talked to him about nesting habits of turtles. He also met children from Colonarie who were the first to receive training on turtle conservation from the Fisheries officer. The Prince’s interaction on the beach continued with a group of children involved in actual turtle monitoring in Big Sand (St. Vincent) and Union Island. 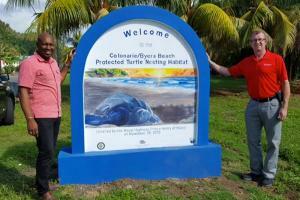 Last on the agenda of his Colonarie visit, was the unveiling of a monument to declare the beach as a protected turtle nesting habitat and commemorate the Royal Visit to the Turtle Sanctuary. He commended the artist Kithesha James from Byera on her beautiful work. The Royal Visit to the Colonarie Turtle Habitat unified all members of the community, from all walks of life and all ages, coming together in the name of conservation, with the message being brought to life through the creative arts.